Going the extra mile to create that spectacular prop or display is what Halloween is all about. Some Halloween props are mechanical masterpieces and can be brought to life in such human-like ways. Others are life-size and realistic because they involve real people to make them work. Crossing The Line: How Far Is Too Far? For example, you might not want to go as far as Johnnie Mullins did when he posed 2 ‘dead bodies’ and ‘splattered blood’ in his driveway — suggesting one guy got his head caught underneath the garage door, and the other guy got run over by the truck in the driveway. 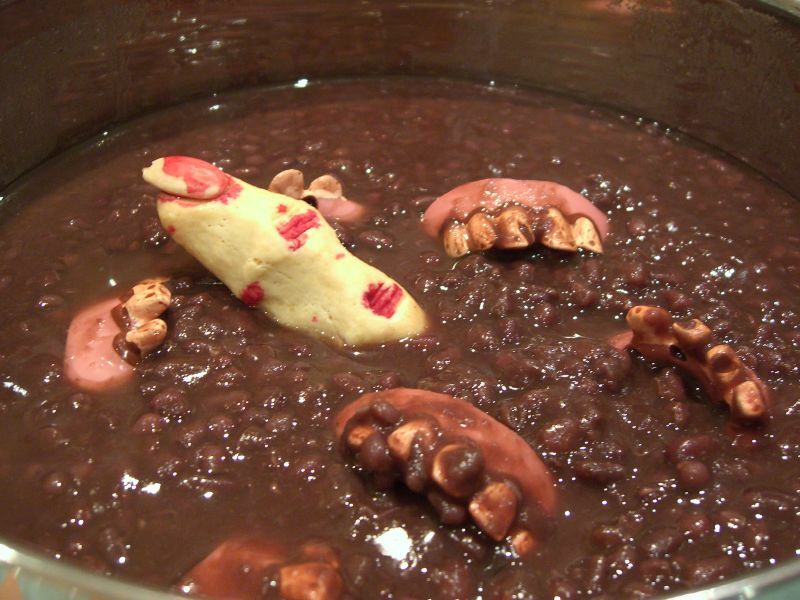 That is just one example of a Halloween prank that looked so real the police were called to investigate. 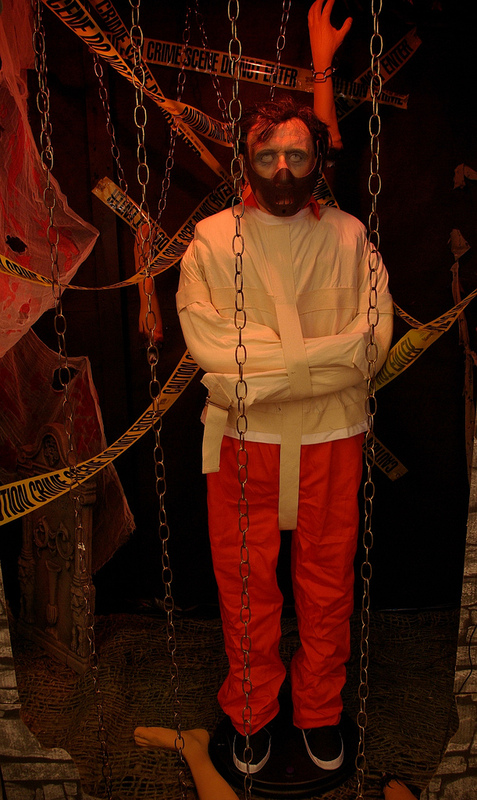 Here are 9 tips to ensure a law enforcement free Halloween. If you create a front yard cemetery, complete with all kinds of blood and gore, the undead will be popping back out of the ground to haunt your visitors. You’ll either keep everyone away out of fear, or you’ll attract all of the curious folks. Either way, this will make your house the talk of the neighborhood! You will need an archway for the Halloween cemetery entrance. These homemade cemetery arch instructions show you how to build your own. Neither expensive, nor difficult to make, a wooden arch painted black will look as dramatic as a wrought iron arch when accenting the entrance to your ghostly dwelling. You may want to partition off the graveyard area from the rest of your yard. 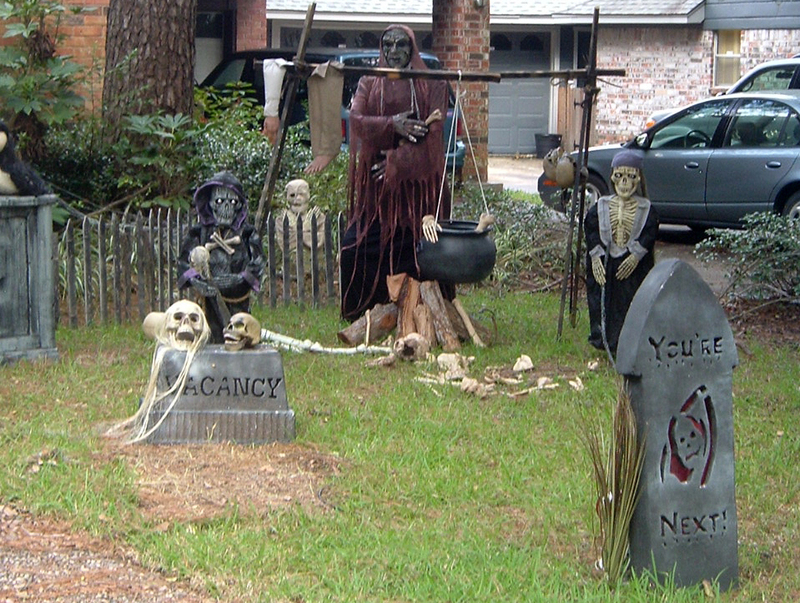 Here’s how to build a fence for a Halloween cemetery. 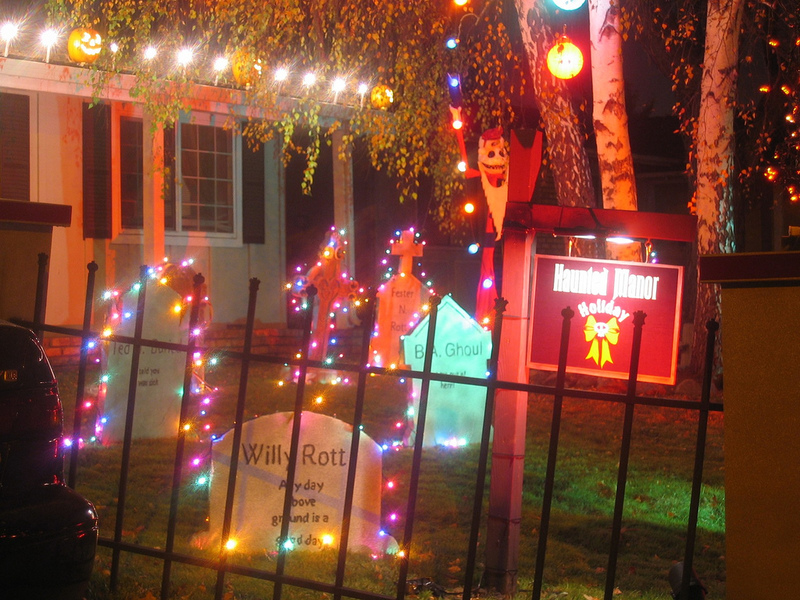 Here’s everything you need to create your own haunted Halloween cemetery — from start to finish. There are excellent instructions for making your own tombstones, along with tips for making other graveyard accents yourself. And if a graveyard isn’t quite what you’re after, then make your own “grounded kids” display this Halloween. It’s fun and simple to make! 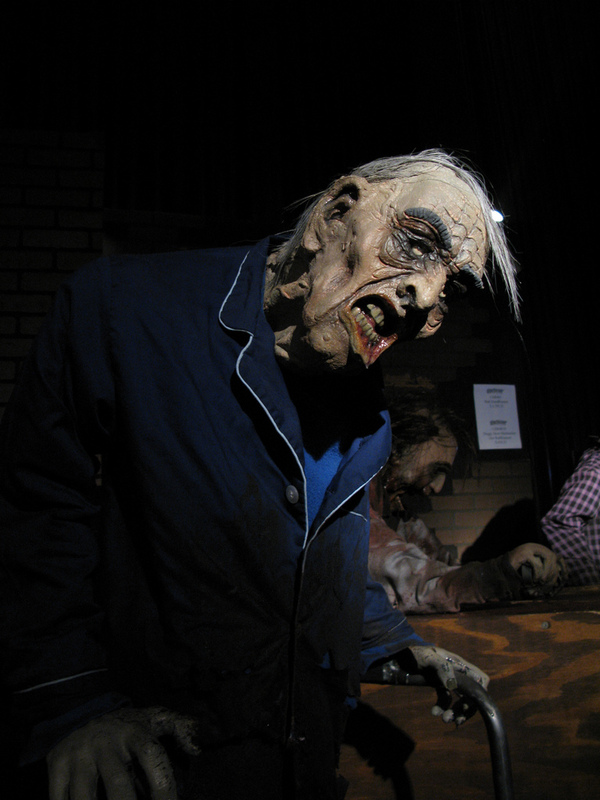 The family garage (or basement) is an excellent space to create the perfect Haunted house for Halloween. Move the family car out onto the street and you can open up your own ghostly spook house. Chances are, you’ve seen Christmas lights displays, where the music is automatically timed with lighting changes — and the lights are all pointed toward a homeowner’s holiday props in the yard and on the house. Well, these days, Halloween light shows are becoming almost as popular as the Christmas ones. 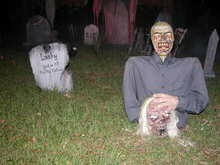 As you collect ideas for creating your own Halloween props for your home or yard, consider the following sources of Halloween props and items for special effects that will help make you the terror of the cul de sac. Combine your efforts with some neighbors and before you know it, you’ll be staging your own community event! Beyond getting your names in the paper you might even help to keep kids safe, since in many areas trick-or-treating has taken a backseat to community-sponsored events. 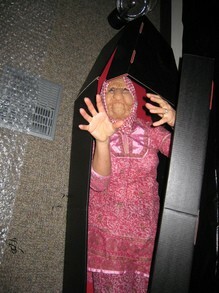 A well “executed” vampire rising out of a coffin is a great Halloween prop you might be able to pull off yourself. Here’s how to build your own motion-activated coffin for Halloween. A dead alien is another great Halloween prop for the coffin. A wicked skeleton poised to do some serious scaring will set your house apart from the rest in the neighborhood. Here’s how to build your own skeleton on a stand for Halloween. The Yard Haunter is a great source for Halloween lighting, doors of doom, fog and graveyard materials. This site covers every possible angle of decking out the perfect spooky yard, including how to do it all yourself from scratch! 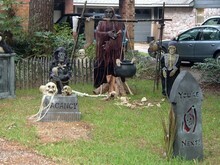 There’s also a site devoted just to Halloween yard decorations. They have a great selection of hanging corpses, skeletons, and other creepy things like demon dogs, and spinning pirate skeletons. Be sure to check the Halloween clearance items for great deals on last-minute Halloween props and decorations! Halloween Express has lots of spooky realty signs, headstones, vampires, and more. They even have arms clawing their way out of the ground! The Haunter’s Depot has all the best life-size props to turn your house into a haunted mansion, like this rocking granny and Dead Fred. You won’t find any more realistic looking Halloween props!